Why Do Planets Look Like Stars in the Night Sky? 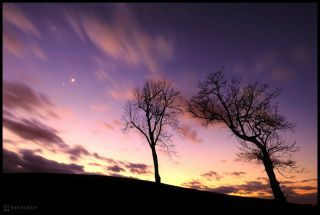 Skywatcher Jeff Berkes took this image of Jupiter, Venus, and the moon with a dramatic skyscape and foreground trees in West Chester, PA, Feb. 26, 2012. Stars make their own light, just like our sun (the sun is a star — the closest star to Earth). But the stars are very, very far away from our solar system so they appear to be very tiny to us, even though up close they are large. The planets are much closer, inside our solar system. Although the planets are much smaller than the stars, planets appear to be about the same size as the stars because they are so close to us. Planets don't produce their own light. They reflect the light of the sun in the same way our moon reflects sunlight.